I had fish in the freezer and it’s cold and I want something warm and comforting for dinner. Fish doesn’t usually fit that bill… so what to do?! Here it is mid November and there have been some chilly days and nights, but we haven’t broken down and turned the heat on yet! I know, crazy, but it hasn’t been that bad! There have been some nights in the 30s and 40s during the day, but the house has consistently stayed in the high 50s or low 60s, so doable! Don’t worry… if you come over for dinner we will make sure to turn it on for you! I have a feeling it won’t be much longer before we give in though! Consequently, when it’s chilly, I naturally want comfort foods! Pasta used to be a strong preference or some sort of warm and creamy casserole, but we don’t do much of those anymore… actually not at all! And fish… how in the world could that EVER become a comfort food? 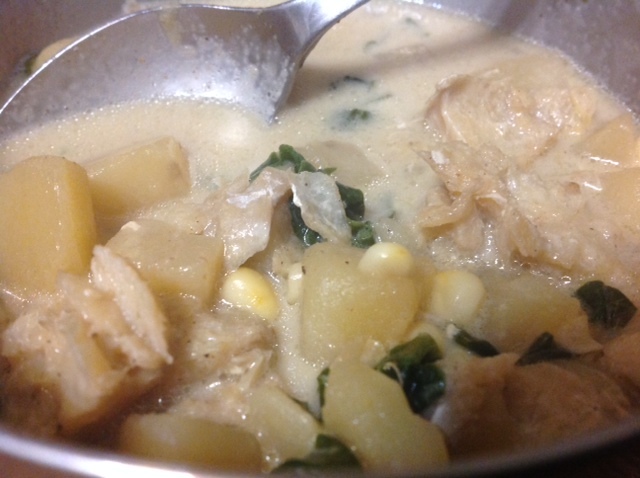 Well… I did some online searching for chowders and pulled together a few recipes, and came up with a hodge podge that turned out! It was fantastic! Richy and creamy and thick and filling and mostly paleo except for the corn and potatoes! Mmmm! I’m not usually a huge fan of fish soups. I think it is the smell that usually turns me off, but not so this time! I used haddock for this recipe and it’s a meaty white fish that doesn’t fall apart too easily and doesn’t have a strong smell or flavor. It was perfect for this soup! The kids really enjoyed it and asked for 2nds and 3rds, that to me is always the true measure of the success of a recipe! I also had a few extra leftover ingredients from earlier in the summer that I had frozen and threw in. I had corn that I had cut off the cob (not paleo, I know, but I can’t throw out good corn on the cob that was locally grown and given to me!) and frozen and also some fall spinach from the CSA that also needed to be used. I also had potatoes from the CSA in the closet that would have definitely kept for longer into the winter, but I thought it would add heft to this recipe, and it did! And in true paleo form I couldn’t leave out the bacon. It goes with everything right! 😉 We had purchased a ¼ pig last year (no where near enough for the year!) and instead of having any curing or smoking done to the bacon, we just had it sliced and had fresh belly. So when cooking it it just smells like frying pork instead of the usual bacon smell… but we have found a way to fix that! We don’t have a smoker but in my dream world we would have one and it would be a perfect way to cook the bacon.. but alas, not so! But next best… I just fry it in the pan with LOTS of salt and pepper and a splash of maple syrup and it is licking finger delish! But I digress… back to the recipe. Here it is! Give it a try and I hope you will enjoy it as much as we did! Fry up the bacon in the bottom of the stock pot. Drain off most of the bacon fat (and if you are me save for frying eggs later!). Leave enough to saute onions. Remove bacon and allow to cool, then chop into small pieces. Add chopped onions to the drippings and leftover bacon grease and saute until soft. Add potatoes and add just enough water to cover the potatoes. Usually just 1-2 cups. Cook until soft, but not completely cooked as they will continue to cook with the rest of the ingredients. Lay the fish fillets on top of soft potatoes and sprinkle with salt and pepper and Old Bay seasoning. Cover and bring to a boil, then reduce heat until potatoes are tender and the fish easily flakes with a fork. Gently break up the fish into large chunks. Add the rest of the ingredients and simmer just until corn and spinach is cooked (about 5 minutes), but don’t bring to a rolling boil. Stir soup gently so as not to break up the fish too much. Serve warm with bacon sprinkled on top. Hopefully you like this as much as we did. It did make a lot of soup as and was still just as good as leftovers. It served our family (2 adults and 3 eating kids under 6) for dinner and lunch with enough leftovers for two more bowls. The two older kids ate more than I did for dinner, so I would estimate that this recipe makes between 8-10 servings depending on how hungry you are! If you make it I’d love to know what you think, or if you have a family chowder favorite, I’m all ears! What a great idea! I used to love clam chowder. I think I could get on board with this… Thanks!